What is a ‘one planet’ approach to sustainable business? Why is it important? What are businesses doing to achieve sustainability? What do business leaders need to learn? 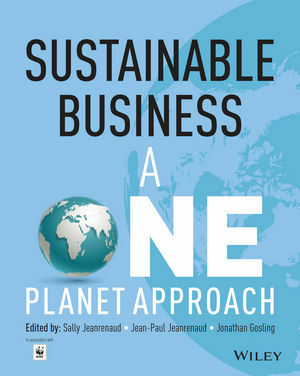 Sustainable Business: A One Planet Approach is a textbook for contemporary business. Recognizing the realities of global sustainability challenges, this book covers the knowledge, frameworks and techniques that will underpin emerging solutions to those challenges. Published in association with WWF (The World Wide Fund for Nature) Sustainable Business is an ideal basis for students at both undergraduate and postgraduate level looking to master an understanding of the relationship between sustainability and business. Edited by three influential figures from sustainable business education, and co-authored by several leading academics, this book offers a wealth of insight and interpretation into new ways of doing business that have a positive impact on people, planet and prosperity. In addition to the many case studies and real-life examples included throughout the book, lecturer slides and recommended web links will be available. Dr Sally Jeanrenaud is a Senior Research Fellow at the Business School, University of Exeter, and teaches in a number of business schools. Sally has 20 years’ experience in international sustainable development, including high-level policy at inter-governmental levels with research, management and field experience in Asia, Africa and Western Europe. Mr Jean-Paul Jeanrenaud is a Senior Advisor to WWF, former Director of One Planet Leaders, WWF International, responsible for Business Innovation and Education Programmes. Prior to that he was Director of Corporate Relations for WWF International, played a central role in establishing the Forest Stewardship Certification, and founded WWF’s applied sustainability programme for senior executives. Professor Jonathan Gosling is Emeritus Professor of Leadership at the University of Exeter and Visiting Professor in the Philosophy of Management at Renmin University of China. He runs leadership development programmes for companies, NGOs and Governments around the world; and publishes research on how managers are tackling contemporary business realities.